Break down your regulatory and contractual obligations into discrete actions that can be assigned and monitored through interactive dashboards. Drill down into each business area and identify where you are exposed, then categorise and mitigate potential risks. Manage IT system risk with user access reviews and contract renewal management. Set up your corporate structure and track all your legal and corporate-level correspondence with regulators. Manage your licence requirements, and statutory and regulatory reporting from one system. Keep a track of all your incidents, complaints and breaches. Use the data to highlight key business risks and implement change management. Validate and check that all the controls you have in place actually work through compliance assurance checklists. Understand your obligations and identify the scope of work you need to perform as part of your organisations compliance framework. Design your control framework based on identified risks and control performance. Identify new or improved controls through your evolving control framework to reduce risk. Implement controls with proactive monitoring and performance management through scheduled control audits, assurance activities and oversight of new registers. "Brilliant way to manage risk and compliance in the salesforce environment. ClrHorizon provides us with seamless integration between our operational activities and compliance obligations. Easy and intuitive to use directly on the salesforce platform, means our risk and compliance activities are part of one holistic system. It provides us with comfort and peace of mind." "I love the way the system helps me keep on top of all my obligations directly from within my Salesforce operations system." Compliance obligations from external sources such as regulations, supply contracts, licenses and guidelines. Operational or Project risks with ratings covering inherent, residual and actual (based on actual incidents). Controls with best practice three lines of defence. Delegation of control ownership with proactive workflow and reminders for actions, compliance surveys, audits and attestations. Manage obligations, risks and controls through their full lifecycle (draft, proposed, approved, retired). Comprehensive registers covering Incidents, Breaches, Complaints, Fraud, Gifts, Hardship, Legal Matters, Regulator Contact and Write Offs. You can also easily create your own custom registers. Fully auditable and customisable approvals for important record changes throughout the system. Create assurance activities for controls and schedule when required to be completed. 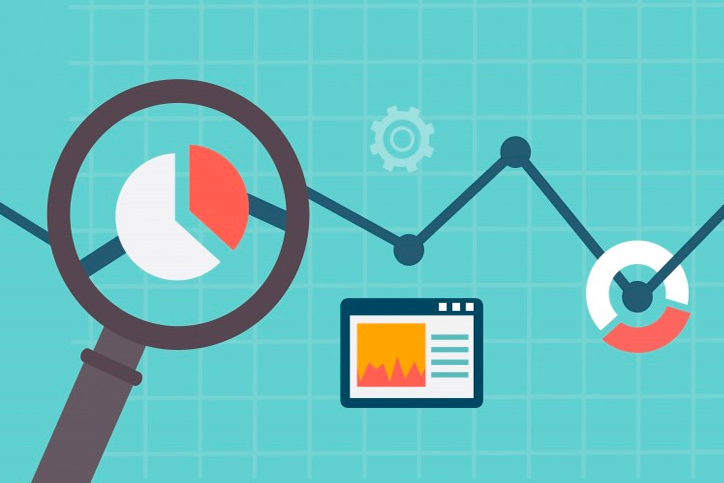 Track both internal and external audits, their findings and actions through to completion. Record findings of both Internal and External audits to business controls for design effectiveness. Build compliance training plans and track completion as well the status of individuals' required Professional Development Points. Keep an up to date catalogue of all policies and procedures related to controls. Includes version control, shareable links and document approvals. Track and report on the status of all risk and projects relating to risk and compliance. Setup and manage your risk and compliance framework by business unit, including reports, dashboards and risk heat maps. Track business critical licenses, insurances and contracts with automated review or renewal reminders. clrHorizon comes with pre-defined risk categories for organisation-wide risk reporting, or you can create your own. Powerful reporting and dashboards including the ability for users to easily create their own. Catalogue all systems and system owners with risk ratings (for example, high risk systems without centralised user access controls). Automatic reminders for system owners to complete regular compliance reviews on user access. Five by Five risk heat mapping, with the ability to filter and customise views displayed by any criteria including by business unit, status, inherent, residual or actual risk, and more. Capture your Business Continuity Plans including critical systems, functions, people and activities to ensure your business is prepared for that unexpected event. Track signatories and authorisations lists for the organisation in its relevant market, including bank signatories and entity signatories. Generate and assign action plans with due dates based on incidents. clrHorizon allows for automatic creation of critical actions. clrHorizon offers role-based pricing, making it simple and affordable to implement across businesses of all sizes with any number of locations, teams and subsidiary operations. Integrated Risk Management means your risk and compliance system is not siloed from your business systems. clrHorizon is built on the world’s leading business platform, Salesforce.com.This means you can have a 360 degree view of your risk and compliance data fully integrated with your existing business processes and visible and reportable alongside your customer, supplier or partner data. Not only that but the platform your business users are using everyday is now also their risk and compliance system allowing ownership and activities to be assigned directly either automatically or manually. What is Evidence Based Risk Management? Evidence based risk management is the fundamental shift away from the common risk and compliance failure of stating that something is compliant versus being able to show with evidence that it is compliant. clrHorizon is built on the philosophy of Evidence Based Risk Management. How can I implement crHorizon? The first step is to talk to us! We are risk and compliance people and love talking risk and compliance.Generally the first thing we like to do is understand the key problem you would like us to help you solve. We can then work with you to review all problems in your current risk and compliance operating model and solution these to provide an implementation roadmap. Do I need an existing Salesforce license? 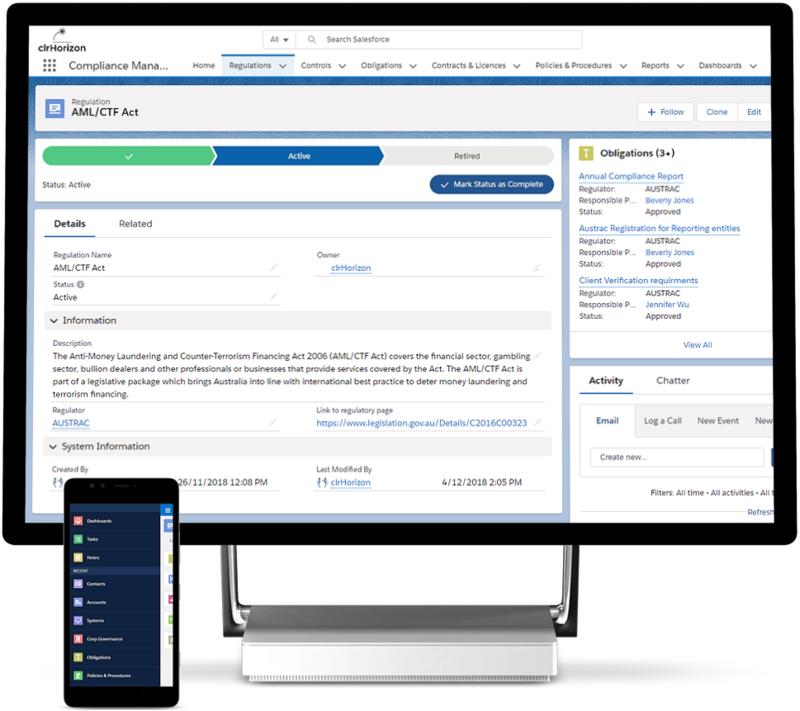 You can use clrHorizon without already having a Salesforce license or using Saleforce.com already in your organisation as clrHorizon can be installed as a standalone Salesforce app from the appexchange. However, if you do already use Salesforce extensively in your organisation you can take full advantage of a completely integrated risk and compliance system alongside your existing organisational processes and data in Salesforce. Yes absolutely, we have built clrHorizon on the most secure, upgradeable and customisable business platform in the world - Saleforce.com. Say goodbye to long timeframes and big costs to make changes and say hello to a risk and compliance system that can keep pace with changing demands. Salesforce.com has an unbeatable security record globally, and publish detailed information on their security credentials on trust.salesforce.com. We also offer a Salesforce Technology Risk & Compliance framework, included with clrHorizon for customers using this platform extensively. This includes regulations, obligations, risks, controls, risk projects and training plans to get you started. The recent Royal Commission into the Finance Sector highlights the need for radical rethinking in the risk and compliance arena. 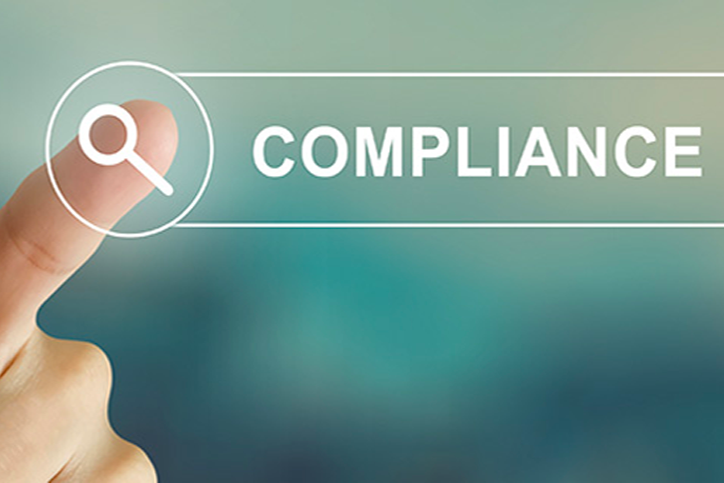 clrHorizon sees corporations moving rapidly to Evidence-based compliance and risk management over traditional Statement-based compliance and risk management. Risk and compliance tend to be reactive, and undertaken only in response to something going seriously wrong.Compliance by design is moving from reactive to proactive by committing to governance at an organisational level. I can't believe it! Dave's Leaving. What do you do when a key member of staff leaves?, well you start by working out what they need to hand over and work out what they own. Our mission is to help our customers succeed in effectively managing their risk by creating the best risk and compliance software, training and support. We believe implementing world class risk and compliance should be easy not hard.